Planning a little Gambling Excursion to Las Vegas? Then this 3-piece set is sure to bring your Luck!!! Las Vegas Luck Ensemble, includes a 18″ Necklace, 7.5″ long Bracelet (standard length), and a 3″ long pair of Earrings. This Ensemble is made with Gunmetal & Silver Findings, Lobsterclaw Clasps, and Leverback Earwires. 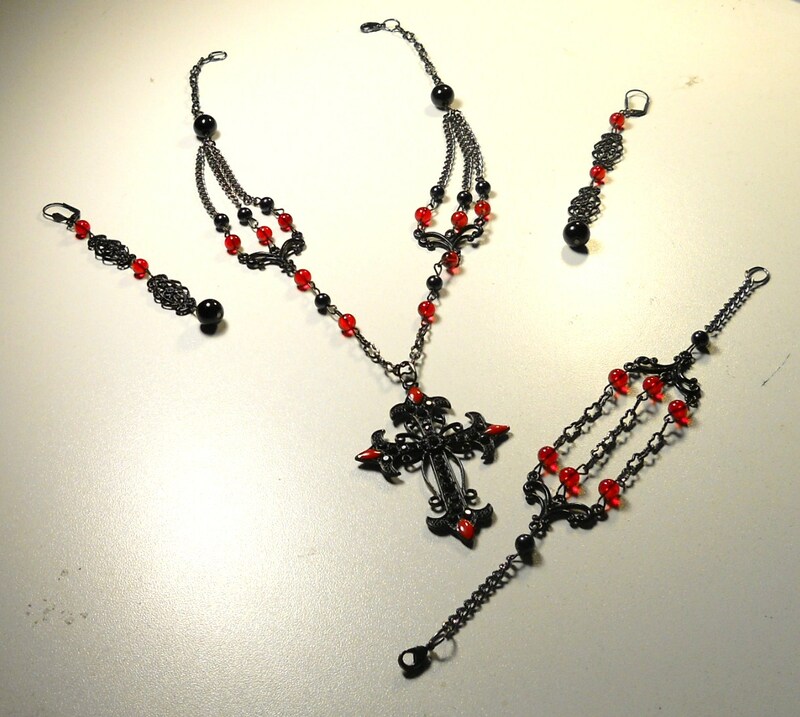 The set is topped off with Black Onyx Wavy Beads and Red Crystal Dice. Win Big, by just wearing this fantastic set! Another Designer Original from Jewels Designs, Black Velvet Jewels Line. Check out this set and all of our other art creations at Jewels Designs. This three-piece set is part of our Black Velvet Jewels Line. The Grapes of Wrath Ensemble includes a 16″ Necklace, 7.5″ (standard) Bracelet, and 1.5″ Earrings. 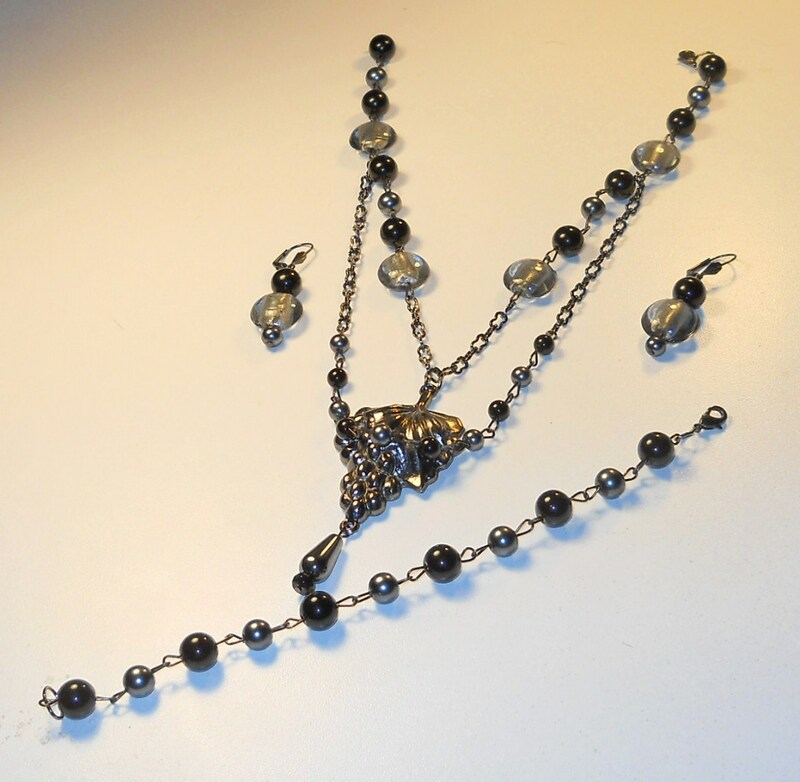 This set is made with Gunmetal Findings, Lobsterclaw Clasps, Chains, and Leverback Shell Earwires. It has a very large Black Metal Grape Centerpiece with a Silver Platinum Teardrop hanging from the bottom. 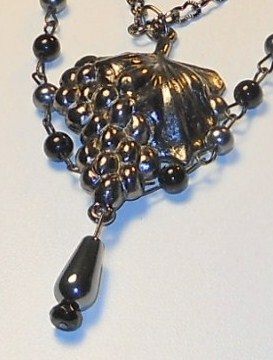 The set also includes Black Onyx, Platinum Pearls and Silver Round Glass Beads. This set would look fantastic with a white, black and/or silver/grey outfit. It can also be dressed up or down depending on your event. It’s another Designer Original from Jewels Designs. Check out this set and all of our other designer pieces in our Black Velvet Jewels Shop. Cute & Fun! Two words to describe this two Piece set. The Necklace is 16.5″ long and the Earrings are 2.5″ long. 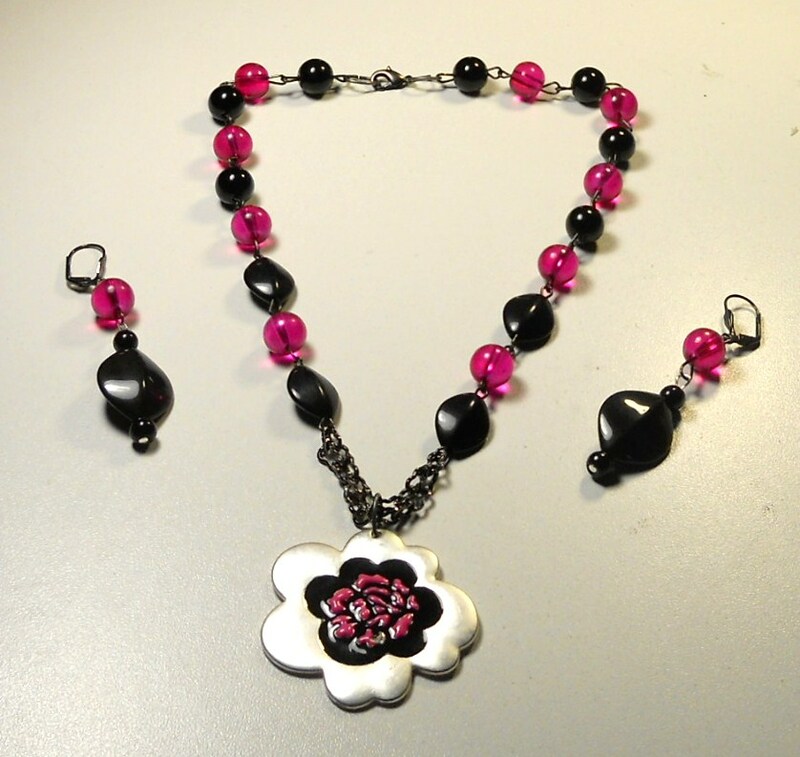 This ensemble is made with Gunmetal: Findings, Chains, Lobstersclaw Clasp and Earwires, Pink Crystal Beads, Black Onyx Beads, and Black Ceramic Oval Wave Beads. 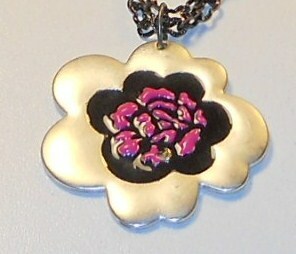 The necklace is finished off with a large silver, black & pink enameled flower. This is a perfect gift for the young and the young at heart. It’s another Designer Original from Jewels Designs. Check out all of our beautiful art work, and find yourself a wonderful gift. This is a one-of-a-kind set, and is a part of our Bold & Beautiful Jewelry Line. This ensemble is from my Black Velvet Jewels Line. The Necklace is 18″ long, Bracelet is 7.5″ Long, and the Earrings are 3.5″ Long. I think that this is one of my most striking pieces and I loved making it. We offer a Payment Plan for this set. Check out all of our wonderful designer pieces on Jewels Designs.